The sunlit charm of dancer and choreographer Rhagav Handa burst irrepressibly through the phone from Cairns as he spoke candidly about the 12-year journey towards making his third solo work Mens rea: The Shifter’s Intent which debuted at the Cairns Contemporary Arts Centre and will travel to the Judith Wright Centre in Brisbane in early July. 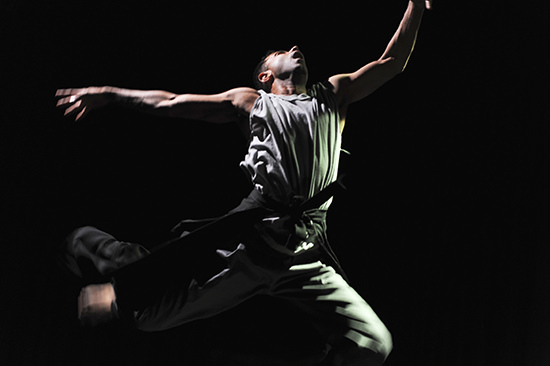 While the artist acknowledges that his third work is “pushing at the very limits” of the solo form, its origins lie with Handa’s earliest and most enduring connections to dance. He tells a story of his mother—a familiar character to those who saw Tuk’re and clearly a force to be reckoned with—trying and failing to interest his sister in traditional Indian dance classes and, as a young boy, being corralled into taking her place. The enduring image he describes is his delight at dancing with bells on his feet. Although the influence of these traditions lessened as he grew older, the pull of dance proved irresistible and his first stage role was as Chino in West Side Story. Dance captured him, but once again he pushed past traditional forms and, in the early noughties, in a series of those accidental inevitabilities that often occur, he met his mentor, the extraordinary Indigenous choreographer and cultural leader Marilyn Miller and made his debut with her ground-breaking work Quinkan in 2004 at the Adelaide Fringe (remounted in 2008). Handa then embarked on a sustained career within the blossoming of Indigenous dance that we have been blessed to witness in the last decade, performing in Raymond Blanco’s Intentcity and Vicky Van Hout’s Wirad’journi, My Right Foot Your Right Foot and Briwyant (reviewed here and here). 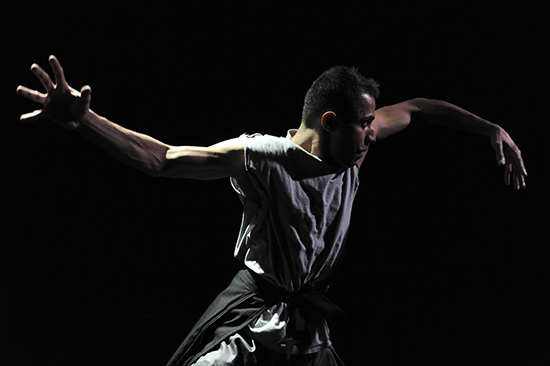 Handa was born in India and raised in Australia, yet here he was learning ancient and important traditional dances, shapeshifting into fluid embodiment within the safe confines of the rehearsal rooms with powerful Indigenous choreographers. Nonetheless, he understood that this was work he could not begin in a room of his own. Yet the elders would watch him and say that he danced like a blackfella—a Darwin boy specifically. Why did he feel so comfortable, so at home within the gestural vocabulary of traditional and contemporary Indigenous forms? His neglected Indian heritage and the malleability of his own cultural practice were to be the starting points for what he thought would be a single solo work. As it turned out, there were three works, with KumKum and Tuk’re being strongly autobiographical meditations on his lineage and the traditions of Indian dance and contemporary form. Both shows were greeted with joy, not just their intimacy and charm but from a sense that at last there was a genuine, new cross-cultural voice for the representation of Indian-Australian performance. This is not to dishonour the long and often neglected connections between traditional Indian dancers and Australia, but rather to acknowledge the excitement of the integration by a choreographer fluid enough to hold multiple traditions within his gestural and choreographic vocabulary alongside a desire to experiment—and with a nuanced understanding of contemporary form. Indeed, in an attempt to deeply interrogate his connection to Indigenous dance Raghav Handa set up two potentially antithetical processes to investigate the question at the heart of Mens rea. What triggers your intention to act, your shift of intent and the subsequent shift of atmosphere before you move into physical action? What is at the heart of this delicate and potent shape-shifting? The first process involved visiting, with his mentor Marilyn Miller, Indigenous communities in Far North Queensland like Laura and Yarrabah and talking with elders such as King Vincent Jabaan Shreiber of the Gunggandji people. The second involved a collaboration with the Deakin Motion Lab. Knitting together these two highly disparate interrogations is the section of the sacred Sanskrit Indian text, the Ramayana, preoccupied with motifs of shape-shifting, The Theft of Sita. Although there are many different versions of the story, essentially Sita, the wife of the God Rama, is kidnapped and then rescued by demi-God Jatayu, a shape-shifter who can become a vulture but who, in turn, is captured and mutilated by Ravana, a shape-shifting demon. The Deakin team used their nifty motion capture system to record and then animate each of the characters, although Handa says that his characteristically energetic style meant that the Lab didn’t end up doing much additional animation over and above the capture. 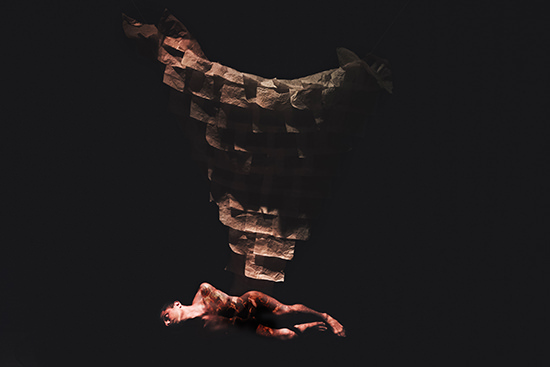 Mens rea, unlike the personal and candid tone of Handa’s two works promises a more epic and ambitious form, with different aesthetic languages and spaces for each character as well as the arresting shape-shifting projections that he created with Deakin that engulf and transmogrify him at various points in the production. Handa acknowledges that pushing the solo form that has served him so well previously is a risk, as is trying to ‘organically’ integrate technology into his intimate but intense and rhythmically complex gestural form. Finally, the potential sensitivities and protocols required to even begin to explore cultural and gestural connections between Indigenous and Indian dance forms such as Kathak are immense—these have grown in the 12 years of the artist’s career. However, although Handa says he fears he might be “punching above his weight,” I cannot help but think of how the best artists I know do exactly that—they do what they fear they cannot. All of this bodes very well for an evening of intimate contemporary dance full of visual allure and shifting cultural engagement, truly the kind of work that pushes into the future and shows us what sophisticated cross-cultural form can be.